The Surface collection initiated with a decorated vase extends and now includes the surface of two inseparable porcelain plates Surface 02. 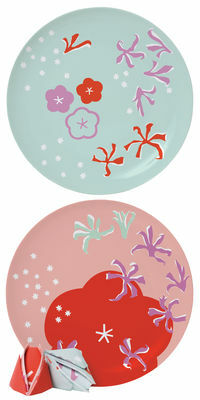 Archetypal quality and the interest of these plates is in the graphic work of a dozen designers and graphic artists. For the second Surface collection Domestic have again chosen to produce a plate of pre-existing design and to solely consider the graphics applied to the surface, which in itself is naturally an act of design. Design: Studio Job, Dylan Martorell, Ich&Kar, Antoine+Manuel, Geneviève Gauckler, Tado, eBoy, Jeremyville, matali crasset, Maison Georgette, Kustaa Saksi, Tania et Vincent, Pierre Marie, Rolito, 5.5 Designers.